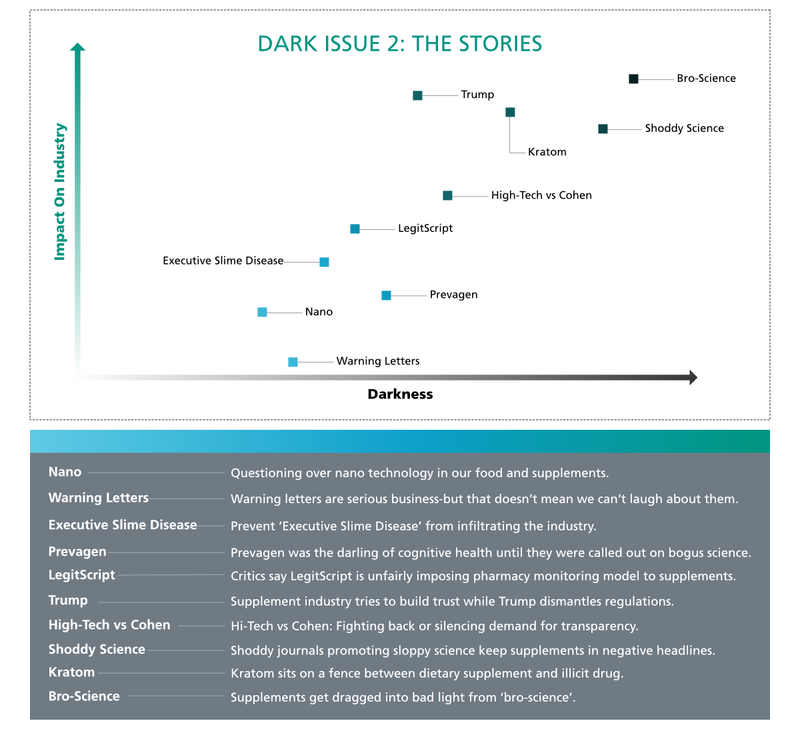 The stories from the second iteration of Nutrition Business Journal’s Dark Issue came in a different shade. As we learned in Rick Polito's Editor’s Letter from Dark Issue 2, it was also a little harder to put together. We’d hit the obvious issues and villains last year. This year we had to lean in a little closer to look for the stories you will read here. Dark Issue 2 peers into the darkness through a new lens and ventures further into the stories to see how they connect and impact the industry for better or worse. Our not-so-scientific chart below plots the various stories from the issue, comparing their 'darkness' to their impact on the industry. You'll notice that stories like The lessons of Hi-Tech Pharmaceuticals vs. Pieter Cohen fall somewhere in the middle, supplements getting dragged into the bad light because of 'Bro-Science' is among the darkest, and questioning over nanotechnology is too small right now (pun intended) to really have an impact. Let us know where you agree, disagree or are downright outraged. We love a good debate. Get the full scoop on these 10 stories (plus one Q/A) when you purchase The Dark Issue 2. Included in your purchase is the Dark Issue 2 webinar, where supplement attorney Rick Collins talks about the mistakes he sees too many companies making, food scientist and NBJ Advisory Board member Kantha Shelke speaks on emerging issues surrounding nanoparticle technology in food and supplements, and Joe Cannon (Supplement-Geek.com) provides an independent take on supplement industry science claims.